The WeatherTech FloorLiner is the Interior Decorator’s Choice for Your Car. WeatherTech has done it again. The people at MacNeil Automotive (who make the WeatherTech line of products) have a knack for making something as functional and simple as a car floor liner look like a work of art. Their new DigitalFit FloorLiner is no exception. It is thermoformed from molds created using digital laser technology and advanced machining tools. That way you get an exact fit for your vehicle. The front mats are made of a 3 layer material consisting of a core of rigid polyethylene sandwiched between two layers of thermoplastic elastomer (TPE). The TPE gives the liner a soft, almost rubber tactile feel, while the polyethylene core keeps the liner rigid in both hot and cold weather. The second and third row liners are made from a single layer of ThermoPoly Olefin (TPO) which is wear resistant and folds easily for cleaning or shipping. The WeatherTech Digital Fit FloorLiner is channeled on top to carry liquid gunk away from your feet towards a reservoir area behind the accelerator pedal. On the underside of the liner are ridges to prevent the liner from slipping on your vehicle carpeting. Or you can use the existing mat retention systems in your vehicle to secure the Digital Fit Liner. As a bonus the edge of the liner fits over the rocker panel, so when the liner fills with water or whatever, you just tilt it toward the door and it hopefully empties outside the car. Be Careful ! When you empty these mats not to dump the trapped liquid onto your pants and shoes! And, of course, remember when you install these liners to remove the carpeted or rubber mats you already use, so your new floor liner sits happily and securely on top of your vehicles carpet. Universal absorbent car mat protectors may be of benefit to you when using any floor liner. These mats prevent trapped surface water from getting on your shoes and reduce cleanup time. 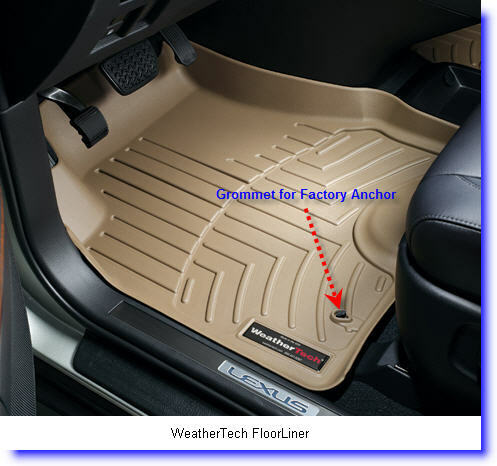 The WeatherTech Floor Liner product is a great alternative to floor mats. These floor liners provide greater coverage of your car or trucks floor pan and seem to move around less than regular car mats made of comparable materials. Huskys WeatherBeater Floor Liner product is another example of a great floor liner made in North America that directly competes with WeatherTech's offerings. And since both Husky and Weather Tech sell top quality, premium products, you might have a tougher choice to make than it first appeared.